The current housing slump could force developers to delay their plans for new eco-towns, it is claimed. Over recent months England's biggest house builders have shed thousands of jobs and share prices have plummeted as house sales have fallen away. On Monday, Persimmon said it had cut 1,100 posts since the start of the year to try to cope with the downturn. It reported that house sales in the first six months of the year were down by a record 31%. About 2,000 jobs at rivals Taylor Wimpey and Barratt Developments have also gone or are set to be cut. In the short term this could have a "severe" impact on the 15 new towns currently proposed for areas across England, according to the Royal Town Planning Institute (RTPI). 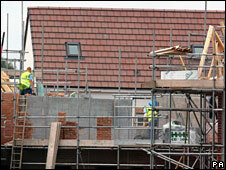 Persimmon and Barratt are among leading developers that would be expected to build the towns. 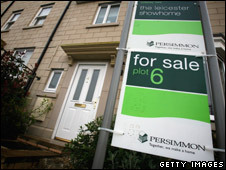 But Persimmon has already pulled out of an eco-town scheme in Rossington, South Yorkshire. Initial plans for a 15,000-home town on former colliery and green belt land were scaled down after criticism from the Eco Towns Challenge Panel. UK Coal, one of the partners in the consortium, said Persimmon left after green belt land on which it had options was dropped from the development proposals. John Harris, chairman of the consortium, said it was down to the partnership, and not the house builders, to drive the proposals forward. He said architect Spawforths was currently drawing up revised plans for the town. Rynd Smith, director of policy at the RTPI, said a combination of the credit crunch and political uncertainty could cause developers to hold back from committing money on designing them. He said infrastructure, such as water supplies, schools, GP surgeries and roads, was expensive and that all this must be done before plans were submitted. "Just keeping that bandwagon rolling has a cost. It could mean delay and in fact there could be some other potential reasons for delay which are around decision making uncertainty. Shares in house building firms have plummeted in recent months. "We're getting into a period where the potential movements of a future government become important." He said eco-town investors would either want to get plans firmly in place before the next General Election, or largely hold off until after 2010. The Conservatives have expressed opposition to the current eco-town plans. "I suspect that given the economic conditions it is beginning to point to delay," Mr Smith said. "[Developers] are maybe not moving as fast as they would have done a year ago to commit money to get new units of housing on the ground." He said he thought the government needed to rethink its whole housing policy in light of the economy's current state. "If economic uncertainty continues for more than a few more months then the degree to which [eco-towns] are economically feasible will shift." A spokesman for the Local Government Association (LGA) said it was vital that more homes were provided, but that the credit crunch could stop new towns being built. The LGA has criticised the proposed locations of many of the towns. "The financial situation we're in at the moment could mean that no one will be available to build them when we actually find the sites," the spokesman said. But some claim the current economic crisis will pass without derailing plans for the new towns. St Modwen, which is behind the 6,000-home Middle Quinton scheme near Long Marston, Warwickshire, insisted it was sticking to a tight timetable. John Dodds, regional director, said: "The selection process for eco-towns should surpass the current economic uncertainty. 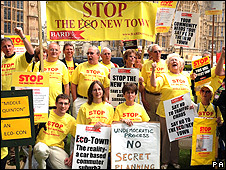 "The government is not expected to make a decision about the final eco-town shortlist before 2009. "Should Middle Quinton be selected as one of the final 10, our proposals will still be subject to a detailed planning application. "Considering these timelines, we would not realistically expect to be starting on site before 2012, by which time we would expect the current economic uncertainty and the reported housing crisis to have subsided. "If Middle Quinton is selected, we expect the development opportunities it would offer to be very attractive to the house building sector." While Abigail Davies, head of policy for the Chartered Institute of Housing, agreed the downturn would not kill eco-towns. "I don't think you can ignore the current problems, but because of [the towns'] nature it's not going to make it grind to a halt." But she said the affordable element of eco-towns had to be flexible to respond to local demands. "I suspect [the homes] will appeal to a certain type of people who move there as a lifestyle choice." A spokesman for the Department for Communities and Local Government said: "It is important to remember that the first eco-towns aren't due to be completed until 2016. "The conditions remain in place for a healthy housing market over the long-term, including the fundamental mismatch between demand and supply."